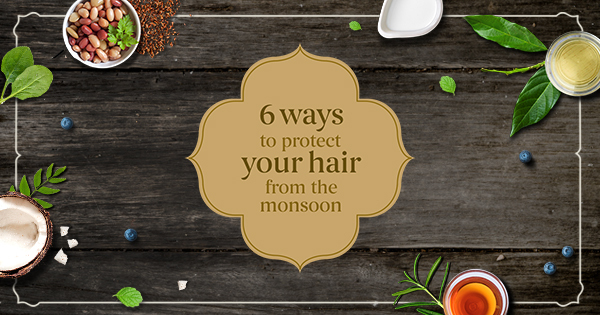 While the rain looks gorgeous through your window, you know it doesn’t do any favours for your hair! And as much as we’d all like to stay cosy indoors with a good book and a hot cuppa, there’s no shying away from the pitter-patter of the rain. Well, we’ve got your hair covered for the days that you absolutely have to step out. What happens to your hair during the Monsoons? The excess moisture in the atmosphere finds a way into your hair shaft, swelling it up and causing frizz. This gets aggravated if your hair is dehydrated. A dehydrated, perspiring scalp is common during the humid monsoon months - an ideal breeding ground for Dandruff. When your hair and scalp takes too long to dry in this weather, that doesn’t help either. Your scalp stays moist for longer through this season, thus producing lesser sebum and leading to dryness.